I am getting this error "Inconsistent line ending error" at random times in the Visual Studio. Since I am using Github to update my project, I can see when I compare old and new files, the CLRF is changed to CR at some lines (usually on the lines where we made changes). 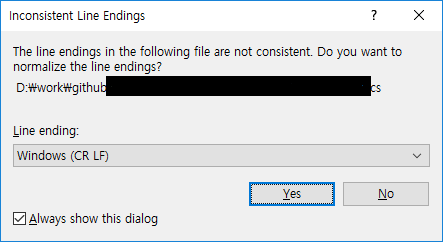 I already tried clicking 'yes' and unchecking 'Always show this dialogue', it doesn't help. I still encounter with this popup from time to time. Anyone who came across this problem please help me. I am attaching the screenshot of the error I am getting! Browse other questions tagged github visual-studio-2017 tortoisegit or ask your own question. How to change local Service Fabric default launch url? Who's right here? g++ or Visual Studio 2017?